scarves and by the yard only. Special order item allow 4-8 weeks for delivery. To find out what Irish county your family has connections to please see the Irish Names & Origins page of this site. 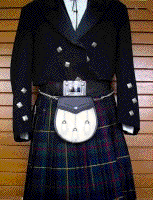 If you are looking for Scottish Tartans please see the Tartan List page. 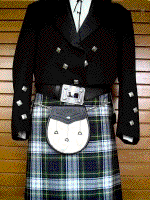 Irish tartans of a general nature include the St. Patrick's or Tara/Murphy which is available in all worsted wool readymades shown on the Highland Wear page of this site. General Tartans for Irish Families available in all worsted wool readymades. 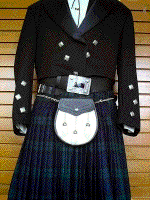 These kilts from Ireland are made in stock waist sizes and are an excellent value. they are suitable for someone to wear to a highland/Celtic gathering or wedding without the expense involved in having one made to measure. 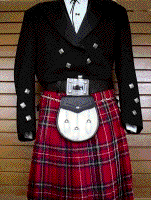 For a more formal kilt see the Mens Kilts page of this site. 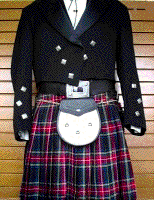 For ladies kilted skirts see the Ladies Kilted Skirts page. Delivery from Ireland in aproximately 4-12 weeks for most orders. Available in a limited range of tartans shown below and in men's waist sizes from 28-48. 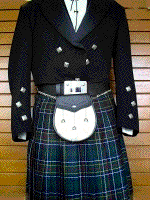 All kilts are a standard 23" in length. L-R: Dress Gordon, MacLeod Hunting, Royal Stewart. Please specify the tartan desired on the shopping cart page.